A fascinating study that is not limited to an academic discussion. By Dr. Robert L. Thomas. 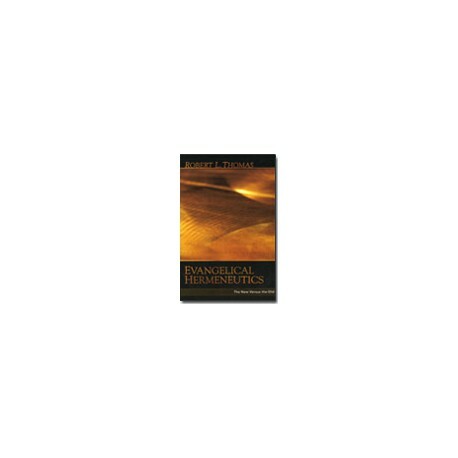 In Evangelical Hermeneutics, Robert L. Thomas carefully chronicles and evaluates how Evangelicalism has emptied itself theologically by allowing novelty, experimentation and cultural trendiness to replace the historic, bedrock affirmations that characterize evangelical faith. • Long-standing definitions of words have been altered. Each topic is treated in considerable detail including a helpful tabular summary of the points discussed. The chapters covering the principle of single meaning, and the New Testament use of the Old Testament are particularly useful as they illustrate the varied approaches taken by different interpreters. The second half of the book comprises an additional 6 chapters which discuss the symptoms resulting from the departure from traditional historical grammatical hermeneutics documented in the first half. Thomas (with help from Paul W. Felix) examines the hermeneutics employed by progressive dispensationalism, evangelical feminism, evangelical missiology, theonomy, and open theism. In each case, the doctrinal deviations can be traced back to a shift in the foundational hermeneutics. Don't let revisionist hermeneutics cloud your understanding of how the Bible is to be interpreted and taught. Make Evangelical Hermeneutics a permanent part of your PC Study Bible library today.